Historians like almost nothing better than to find precedents in the past for supposedly new things. “X is nothing new” is a formulation that is likely to be heard in a graduate seminar, an AHA panel, or anytime anyone makes the mistake of suggesting something is genuinely novel. (This is partly why history dissertations almost always end up going further into the past than their authors originally intend.) It is an annoying professional tic, but there is a degree of truth to Solomon’s old axiom that “there is no new thing under the sun.” Even dismissing the newness of things, it seems, is as old as the hills. 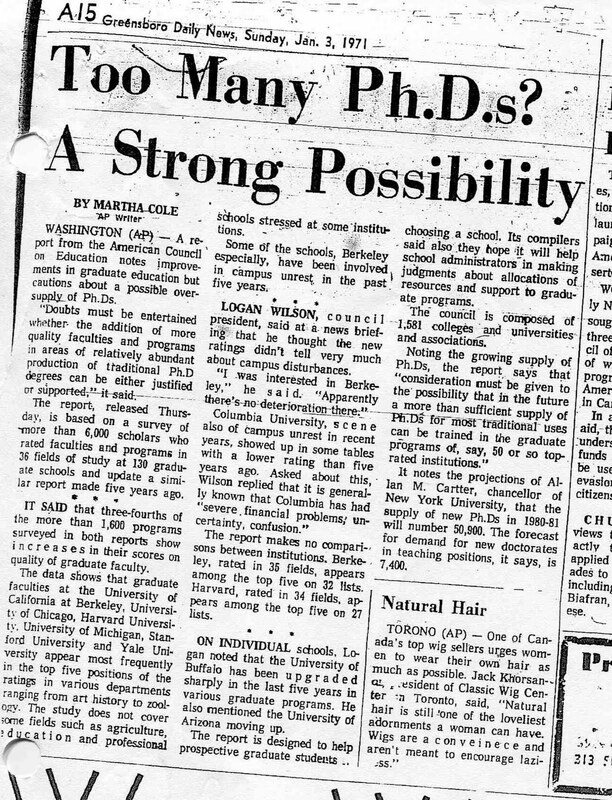 As early as 1971, people began to worry that there were more people with doctorates flooding the market than there were academic jobs for them to fill. 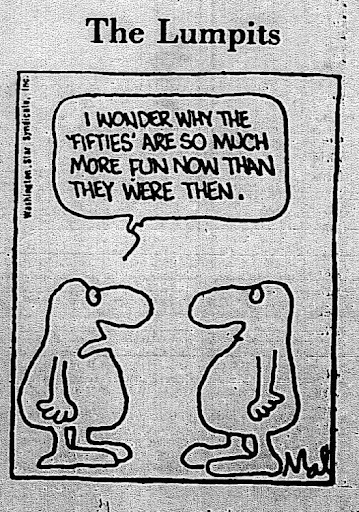 Looks like academia has been waiting for the boomers to retire ever since they first started on the job. Not long after Sarah Palin first “killed her a bar when she was only 3,” American women began to rise up against the tyrannical hand of the IRS. 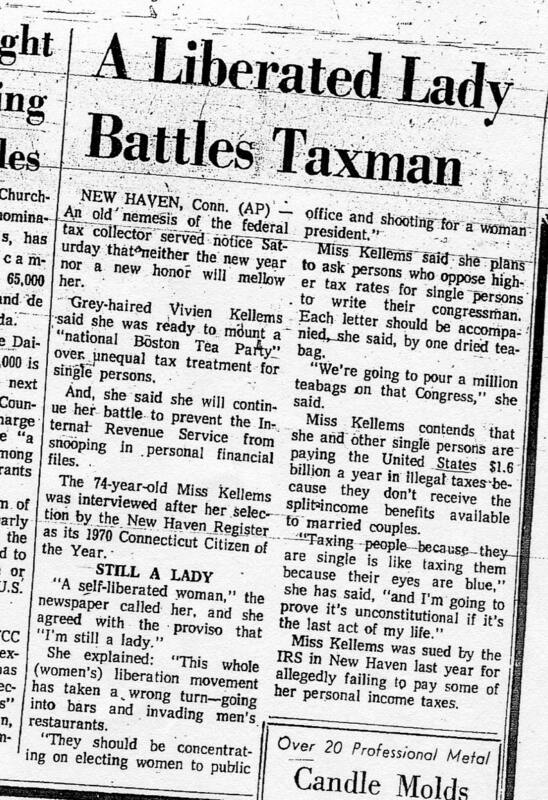 Their leader was Vivien Kellemsof New Haven, Connecticut; at the age of 74, the AP referred to her as “Miss Kellems” but reminded readers that she was “still a lady.” One newspaper called her a “self-liberated woman,” but Kellems disdained feminists for “invading” bars and “men’s restaurants” when they should really “be concentrating on electing women to public office and shooting for a woman president.” The IRS sued Kellems for unpaid taxes the previous year, and she vowed to lead a “national Boston Tea Party” against the unequal taxation of single people like herself. 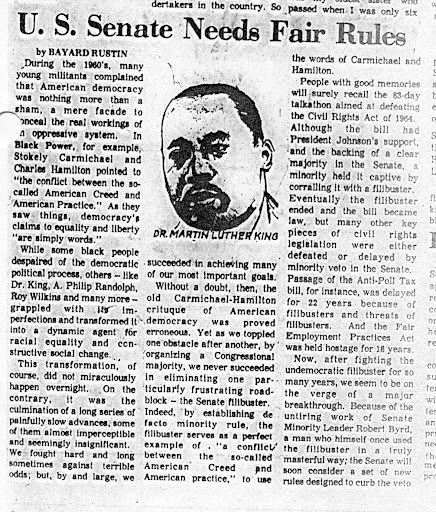 Long-time civil rights leader Bayard Rustin writes in this piece for the Post, the newspaper of Charlotte’s African American community, about how a conservative minority was able to stymie progressive policies by invoking the filibuster, despite the fact that Democrats controlled the White House and both houses of Congress. Sound familiar? Tell the tale, they did. Carter was out and Reagan was in two years later. With today’s meandering economic policy and chronically high unemployment, what are the odds that the resentment behind the current Tea Party movement will grow stronger in the years to come? Its supporters may direct their anger at both the lazy, parasitic poor and the sybaritic elite, as Reagan so successfully did with his rhetoric of “welfare queens” and “limousine liberals.” They may rail against government handouts and corruption even as they cling to whatever scraps of prosperity they have left. (Hence the seeming paradox of opposing government spending and socialism while shouting “Hands off my Medicare!”) Let’s hope this is not the outcome. 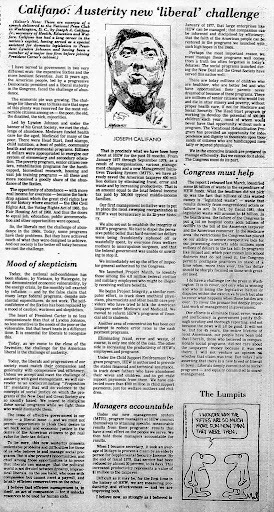 This op-ed by Joseph Califano, a former close aide to LBJ and then-Secretary of Health, Education, and Welfare under Carter, does not give much cause for comfort. The Democratic policymaker looks wistfully back at the 1960s as a time when liberals could wield the growing prosperity of American society to pursue ambitious initiatives to benefit children, the elderly and the poor. The late 1970s, he suggested, were a time of limits, and liberals had to confine themselves to showing a skeptical public that government could actually be efficient and do its job well. The fundamental premise of government services seemed to be under attack, and Califano’s answer was one we have been hearing a lot about lately — cutting spending in the name of efficiency and austerity. Reading through the Secretary’s proposals, one gets the sense that liberals had run out of ideas and had no real solutions to address the country’s economic crisis. One also gets the impression that the Obama Administration has given up on trying to pass any initiatives to fix the economy and hopes to just ride it out through the next election. We saw how well that worked for Carter. Of course, not everyone gets unknowingly swept along in the currents of history, whether in the 1970s or today. The following cartoon appeared, ironically enough, right next to Califano’s op-ed. In it, the Lumpits weigh in on the misguided nostalgia of American culture in the era of American Graffiti and the Fonz. Before we come down with a bad case of nostalgia and flip on That 70’s Show, we might do well to look at the history and learn from another era of filibusters, tea parties, and too many PhDs. We might just manage to avoid repeating some of the mistakes of the past.